"Located at the northern part of the Adriatic Coastline, Opatija's natural landscape is beautifully set overlooking the Adriatic." Opatija is a small coastal town, famous for its peaceful atmosphere, stunning natural beauty and the many gorgeous beaches that lie close to it. This makes it ideal for someone seeking a relaxing beach holiday, be it with friends, family or your partner. The town has always been synonymous with Croatian tourism and was a favoured destination of Austro-Hungarian emperors. One of its most famous attractions is the lonely maiden with a seagull statue that gazes out across the Adriatic Sea. 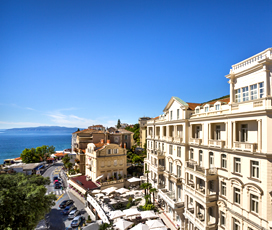 Opatija is popular in both the summer and winter and attracts tourists who appreciate natural beauty, outdoor activities, gastronomy, wellness and history. Opatija is also known for its many trendy bars and exceptional restaurants serving exquisite Croatian cuisine, meaning that it is the perfect place for people who want an active holiday that brings you close to nature. A small coastal town located on the beautiful blue waters of the Adriatic Sea, Opatija has always been synonymous with tourism, having become an important destination in the mid-19th century, it has a large number of beautiful Habsburg-era villas. It is a small town with a population of around 12,000, which when combined with the beautiful beaches and gorgeous nature, makes it the perfect place to enjoy a relaxing holiday. Marvelling in a beautiful climate, it is the ideal place to enjoy a summer holiday. The hottest months of the year are July and August, when temperatures regularly exceed 25 degrees and the waters of the Adriatic are warm and refreshing. It enjoys pleasant springs and autumns, making it a good place to visit for most of the year. Its history dates back to the 9th century BC, to a group of people known as the Liburni, famous for their maritime talents. It came under the rule of the Roman Empire, before passing through Byzantine and Slavic hands. The Habsburgs, took over control of the area in the mid-16th century developing several important religious sights. From the mid-19th century onwards it became a tourist destination, the first of its kind on the Adriatic, becoming a favourite holiday destination for European kings and Austro-Hungarian emperors. In 1889 it was declared the first ever resort on the Adriatic and by 1913 it had up to 12 hotels, 44 bed and breakfasts and 83 villas. It diminished slightly as an international tourist destination during its time in Yugoslavian hands, reclaiming its prominent place, when the country broke up and Croatia was formed. The town is particularly renowned for the quality of its seafood, with grilled fish, stewed muscles and fresh oysters all common. Its most famous delicacy is Kvarner Scampi, which are caught freshly in the spring and summer months and are eaten in a variety of ways including with wild asparagus, as part of a soup, grilled or with risotto. The region is also well known for the quality of its wine, featuring local reds and whites made with indigenous grapes. Comprising of a great selection of activities that the entire family can enjoy spending time together discovering new places and making fun memories. The many beautiful beaches that populate its gorgeous coastline, are ideal hubs for relaxation or to partake in watersports, depending on your preference. Children may also enjoy visiting the Madonna Del Mare, a statue that symbolises Opatija and is located at the entrance to the harbour, gazing out to sea. This alongside the plethora of forests and wooded areas above the city, make it ideal for active families who want to explore nature on their family holiday. The town has many hiking trails and walks that surround the village, making it ideal for anyone who wants to get outside and explore the great outdoors. The town is also home to a number of fascinating monuments, including the famous maiden with a seagull statue and a duo of excellent parks. 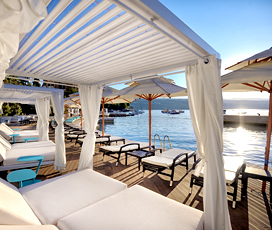 Visitors can also enjoy the beautiful Adriatic Sea and the beaches that populate the coast. Flourishing with a plethora of trendy bars, cool cocktail bars and chilled-out lounges visitors can grab a drink before heading somewhere else or can simply stay and enjoy the atmosphere with friends, family or their significant other. There are several excellent restaurants in the town most of which are found on the Lungomare promenade. There are a number of clubs for people who wish to continue partying that are either clustered around the port area or located in the centre of town.